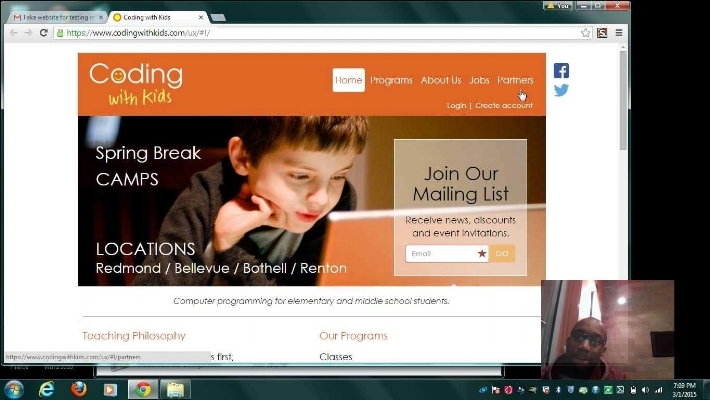 Coding with Kids, an organization that teaches kids to develop coding skills, uses their website to advocate for their teaching philosophy, register students for classes, and complete payment transactions. Created three unique user profiles of parents based on interviews and demographic data. Then recruited seven participants from a screener that corresponded to the user profiles. Conducted heuristic evaluation of website using Microsoft’s “UI Tenets and Traps”. Conducted think aloud test and recorded video of each participant’s voice, facial expression, and cursor movement using Morae software, and also conducted post-test survey. Some important items had a presence on the website, but were effectively invisible - the website should meet parents’ expectations for the location of certain items and the meaning of information listed. In some instances there was information overload. Our suggestion was to convey hard to understand info using narrative instead. Some participants could not even see certain items on the website because of contrast issues. We suggested to follow standard UI guidelines, so that users weren’t met with physical challenges. Recruiting and scheduling took a lot of time for this project, since parents were usually busy being parents and working in most cases. I got experience with concise communication and flexible screening of participants. The Morae software can be a great way to capture rich data, however rehearsal before showtime is a must.